Sir John Newenham Summerson CH CBE (25 November 1904 – 10 November 1992) was one of the leading British architectural historians of the 20th century. He was born at Barnstead, Coniscliffe Road, Darlington. His grandfather worked for the Darlington and Stockton Railway and founded the family foundry of Thomas Summerson and Sons in Darlington in 1869. John Summerson was educated at Harrow and University College London, where he gained a bachelor's degree in 1928. He wrote mainly about British architecture, especially that of the Georgian era. His Architecture in Britain: 1530–1830 (1st edition 1953; many subsequent editions) remained a standard work on the subject for students and general readers after his death. The Classical Language of Architecture (1963) is an introduction to the stylistic elements of classical architecture and traces their use and variation in different eras. He also wrote many more specialised works, including books about Inigo Jones and Georgian London, as well as The Architecture of the Eighteenth Century (1986), in which he describes Boullée in a distinct positive manner, stating that Boullée was clearly the point of departure for one of the boldest innovators of the century, Claude Nicolas Ledoux. Summerson was one of the founders of the National Buildings Record (NBR) in 1941 and was a Commissioner of the Royal Commission on the Historical Monuments of England (RCHME) for twenty-one years, writing the introduction to the book celebrating the NBR's fiftieth anniversary in 1991. He was curator of Sir John Soane's Museum from 1945 to 1984. He was Slade Professor of Fine Art at the University of Oxford for 1958–59. The term Bristol Byzantine, referring to a style influenced by Byzantine and Moorish architecture and applied mainly to warehouses, factories, and other industrial buildings in the city of Bristol, is thought to have been invented by Sir John Summerson. He certainly invented the term prodigy house for showy Elizabethan and Jacobean courtier houses. Summerson was noted for his somewhat elitist approach, and he was not always a consistent friend of the conservation movement. He was hired by the ESB in Ireland to speak in favour of their demolition of sixteen Georgian townhouses in Fitzwilliam Street, Dublin. The doomed terrace, he said, was "simply one damned house after another". 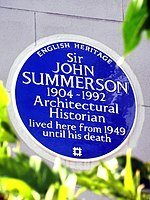 An English Heritage blue plaque commemorating Summerson was erected at his former residence in Chalk Farm, London, in March 2012. ^ "Oxford Slade Professors, 1870–present" (PDF). University of Oxford. 2012. Archived from the original (PDF) on 13 February 2015. Retrieved 27 January 2015. ^ Brace, Keith (1996). Portrait of Bristol. London: Robert Hale. ISBN 0-7091-5435-6. ^ "SUMMERSON, Sir John (1904–1992)" (xhtml). English Heritage. 2012. Retrieved 11 July 2015. ^ "Architectural historian gets blue plaque". Building Design. 2012. Retrieved 11 July 2015.